Before I even begin I must pause and give our pilot credit for an unusually speedy trip to Phoenix. We landed in quite a bit less than two hours from our departure in Portland, taxied up to the gate, our pulses hammering, determined to make that flight to Cabo. US airways has two flights to Cabo each day, and judging by the middle aged men in palm tree printed shirts and women in straw hats who have joined us on our delayed flight to Phoenix, it was a safe assumption that other Portlanders are on their way south as well...other Portlanders with real tickets. We hope to make the first flight, but our chances are slim. I have sat staring out the window for a little over an hour. I am angry and worried and cursing myself for flying standby, even though the discount seemed worth it. My stomach hurts and I regret the many cups of in-flight coffee I have consumed. Ryan is relaxed, but he is always relaxed. Dave is socializing and looks perky. Am I the only one who realizes the pressure we're under here? Apparently so. My right eye is twitching and I wonder if anyone notices. I am thinking very powerful, positive thoughts about sand and palm tree's in an effort to will us to Mexico as our shining 747 approaches the wide-spread arms of the city, a city I have never seen, and the far reaching desert sands and mighty palms come into view. I make a mental note to be more specific when I think things into being. Fate has a funny sense of irony. As would be expected, the airport is packed with individuals who have been displaced by the cancellation in Portland, lines are forming at every counter, people are grumpy and rumpled. The sun is rising beyond the windows and I have to say, we did take a minute to stop and look at this purgatorial city where we were being held. We also stopped to ask directions, amazing with two men with us, and then started running. Let it be said, the airport in Phoenix is enormous. Dauntingly enormous. And, as Murphy would have it, the gate for the Cabo flight was located at precisely the OTHER end of this dauntingly enormous complex. We ran. Ryan took off sprinting while I carried both sets of luggage. He would get our names on the list, which was the most important thing on earth to any of us at that moment. I have made the capital error of wearing very high heeled, uncomfortable (though stylish) boots and am now waddling, twitching and muttering like a crazy crippled person with four bags through the airport. I have taken great pains to look nice for this trip, but cute or not, crazy is crazy, and people are staring. I make it to the gate and Ryan is waiting- he has not been the first on the list. There are many others ahead of us and our prospects do not look good. Here are all those golden-agers in their palm tree shirts and straw hats. They've paid someone to ferry them to the gate in a golf cart. I thought I caught the mixed scent of Old Spice and Jean Nate' wiz by me in the corridor. I hate them now for their unrumpled selves. We wait again and soon the shirts and hats board the plane. The door closes and the customer service agent shoots us a slightly apologetic glance before walking back to the counter to tell us to try again later. More waiting, but this time with lunch and beer. At the counter again several hours later we watch another crowd of shirts and hats board our plane for Mexico. We hate them collectively now, it's not just me. Like it or not, we are in Phoenix for the night. This is NOT what I had in mind. I look at my watch and consider that if all had went as planned, I would be sipping a tropical beverage and lying by the pool at our resort at that moment. The disappointment is staggering. Dave and Eileen were calm, they are along for the ride, they say. Ok then. I am doing self-talk at this point, which differs from talking to yourself only in that you do not have to do it out loud. Also, I felt that adding 'talking to oneself' to waddling, twitching and muttering could just put my traveling companions over the top themselves and so refrained for their sake. Dave uses the public phone and, as is typical of Dave, scores a deal with someone from the shuttle service of the Radisson. There is no room for us in the Inn, he says, but for $5 he can take us to a much less expensive motel behind the Radisson (a stable perhaps?) and with a quick phone call, he can also pick us up in the morning and bring us back to the airport. Well, ok. That sounds good. And this is where the story takes a turn for the more pleasant. We are picked up in an air conditioned shuttle and make friendly and funny small talk with our driver for the five minutes it takes to get to the cheap motel. My twitching finally stops. It is not ramshackle or falling down and it is definitely cheap. There's also a Waffle House a block away. What more could one want? We settle in, which means we dump our bags on the floor, and I half-heartedly wipe the raccoon-like mascara from under my eyes. The driver has agreed to pick us up in the morning for our pre-dawn flight. I have started to breathe again and am thinking about waffles. Sadly, I cannot recommend the Waffle House by the Phoenix airport to any of you. It was a diner. With a very sticky floor. The food was food. That's it. However, at the end of that particular day, it was all we could ask for. Something was said during this 'meal' that cracked us all up- I cannot remember now what it was- but fatigue had set in and we were all a little looney. Needless to say, the mood lifted and of course, when you're completely exhausted, slightly nauseated and in a new city- what does one think to do? Why, pinochle of course! We stumble back to our motel and crash in Dave and Eileen's room with a deck of cards and several cans of pop from the mini bar between us. And then it happens. Ryan sits on the edge of the bed just right and we discover, much to our fatigued entertainment, that this particular bed makes a delightful farting noise when you squish the mattress at the end. That was it. We were goners. Eileen and I were literally rolling with laughter which, of course, brought on the full comedic routine from the guys. Ryan leans in on the bed and, "Brrrrrrppppppttttttt!" Oh, too funny. Root Beer is threatening to explode out of my nose. Dave gets in on the joke and leaps up onto the bed to do his version of a polka, "Brrrppttttyyy, brrrrpppty, burrrrrrrrpttty." There is nothing like an old guy doing a polka on a motel room bed in the middle of the night to set things right again, I'll tell ya. Standing, dancing, jumping on the magic mattress at midnight produced in us a display of juvenile delinquency the likes of which no one has ever seen. And you have to admit, a farting bed is pretty funny. Eventually, however, we did tire of our new sport and fell into our own non-farting bed down the hall for a quick 'nap' before our 6 am flight. Dave called our driver early the next morning only to find out the shuttle was full. If we walked around to the Radisson entrance, he would arrange something, he said. We walked and then we waited. 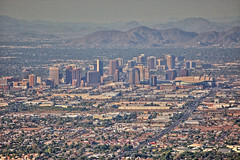 In the end, we were taken to the Phoenix airport, for $5, by a beautiful, private towncar from the Radisson. God bless Dave and his ability to make friends with random strangers. The airport was abandoned at that time of morning, save for a few, like us, who signed up for the red-eye, raw deal flights. We were desperate and again hopeful as we approached the US Airways counter to be met by a frazzled looking employee. She had had car trouble and had been late for work. We sympathized and told her our own story of lateness. She sympathized and we were suddenly friends (thanks Dave). She went out of her way to make sure we were set up for our return flight as well, something Portland had failed to do, and we bought her a latte. The importance of being especially nice to given individuals is not lost on me. Also, bribing people with coffee is not a bad idea either. We watch the sun rise in the Phoenix airport, sip our Starbucks and wait. I make a trip to the restroom and have asked Ryan to find an ATM while I am gone. Better to get our cash out before we leave the country, is my thought. We return. We wait. This is standby. Uncertainty and adventure and acid reflux. I pop a Tums and they begin to board the plane. They signal to us. We are on, thank the Maker.I am breathing. I am not twitching and I am only talking to myself when it becomes absolutely necessary. Signs of progress. The sun has risen over the red hills of Arizona and our plane is pushing away from earth. Dave is socializing again, telling our story, laughing. I can see his cowboy hat several seats behind me bobbing up and down with conversation. Eileen is relaxed and happy, but I feel no need to share in her medicated bliss this time. Ryan is somewhere. We have not been seated together. He would not want to be seated with me now anyway, I am all business, there is no small talk left. I order coffee and listen to two women behind me order the first of many rounds of Bloody Mary's. They are wasted by the time we reach Cabo San Lucas Airport and are standing on their seats and falling forward onto mine. I am ready to crawl through the tiny airplane window to get away from them, but this desire is quelled by the fact that we are actually here. I can put up with anything now. We step carefully down the long flight of steps to the tarmac. I secretly hope the two Cavorting Idiots who sat behind me fall to their demise, but I try to make my face neutral, and also I remember the last time I tried to will something to happen and it backfired, so I let the thoughts go. The Cavorting Idiots would probably fall on me. We make our way to the terminal where there are friendly people in uniforms to greet us. "Bienvenidos to Mexico!" They say with pleasure. I raise one eyebrow, forever the skeptic. lol- they don't put booze in the mini bars of CHEAP motels, silly. "I cannot recommend the Waffle House"
After driving across the country to North Carolina and seeing Waffle House at every po'dunk burg along the way, I asked a dear friend of mine from Florida, "What's up with the Waffle House? Is it safe?" Her reply, and I quote, "Well, if all you have is three bucks in your pocket and you haven't taken a poo in a few day, then it might be alright". I love this story. This may go down in the annals of Kendall lore right next to the Moose Hunt if you're not careful. You know I'm going to ask about the farting bed at the next family get together. Muah!